Above ground swimming pools vary slightly from model to model, but you will find that most manufacturers use the same general pool structure. 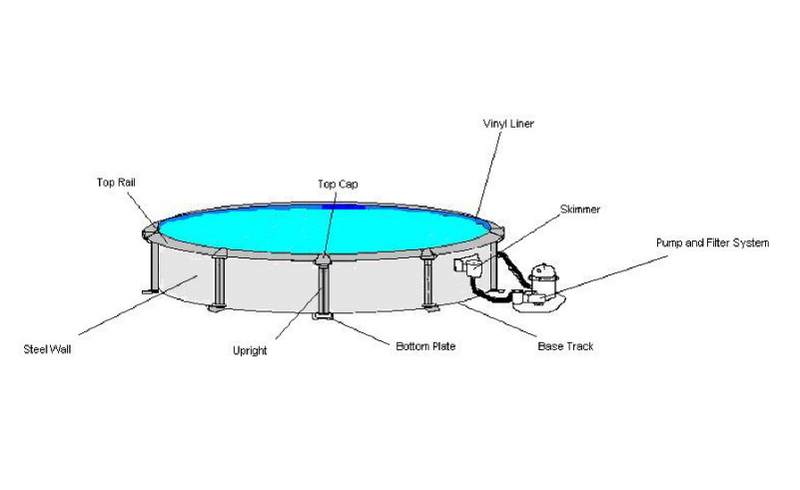 The diagram above shows all the basic elements of these pools and below you will find brief descriptions of each part. Familiarize yourself with these parts should you ever need to replace them. The wall is generally made of galvanized steel, and for round and oval pools, it is usually all one piece. The steel is corrugated for strength and then coated in vinyl and a number of other coatings to help protect it and give it a more attractive look. Usually the more layers there are on top of the steel, the longer the wall will be expected to last. A wall performs perhaps the most important job of the entire swimming pool structure. It has to safely contain up to 200,000 pounds of water weight (even if someone does a cannon-ball!) and it has to do so for the life of the pool. The strength and durability of the wall defines the integrity of the entire swimming pool. Despite their ability to hold back such immense force, above ground pool walls are generally fragile. The steel walls are shipped in coiled rolls, usually tightly bound and boxed in cardboard. If they are damaged, it can compromise the integrity of the whole structure. Even a scratch can become a problem down the road. exposed steel often means that corrosion will simply be a matter of time. Walls should be stood up on end until installed. Laying the coiled wall flat for an extended length of time can cause creasing in the steel. Creasing the wall will weaken its strength, creating a pinch spot where the wall could break under the force of the water behind it. I'm sure you can imagine what kind of disaster that could be, so be careful with it! Some pools have a panel of stainless steel where the skimmer and return fitting are placed. Normally, if gaskets fail and water seeps where the corrugated wall has been punched through, over time, the wall can corrode at these points. The stainless steel panel provides protection against any such corrosion, but aesthetically, these panels leave a lot to be desired. If your pool does not have a steel service panel, frequent leak inspections and occasionally changing out skimmer and return gaskets can help to protect the wall from corrosion and extend the life of your pool. The frame of an above ground pool secures the wall in place and provides much of the strength for the pool. It is important for the frame to be strong and able to withstand exposure to the elements, so they are generally made of coated steel, extruded aluminum, or resin. Top rails form the top ledge of the swimming pool. Ranging from 2" up to 12" in width, they connect between each post (upright). You want these to be sturdy and tough, but keep in mind, no matter how stable they seem to be, top rails are not designed to be sat, stood, or walked on. Sometimes called a stabilizer bar, the top track rests over the top of the wall, but beneath the top rails. The top track interlocks from top plate to top plate, helps to keep the top of the wall straight, and helps to secure the pool liner in place. The base track stretches from base plate to base plate, between the uprights of the swimming pool, forming the bottom rim of the pool structure. During installation, this track has a groove in which the wall of the swimming pool is rolled into. The uprights, or posts, provide support for the wall and top frame of the pool. They range from 4" to 12" wide, depending on the pool and the material they are made of. You will find one of these attached to the top of each upright. They provide connection points for the top track and top rails that span between each post. The base plates sit beneath each upright, providing a connection point for the upright itself and the base track. Usually made of resin or other form of plastic, the top cap covers the top plate and help to give the pool a more finished, attractive look. Some pools have plastic or resin boots at the bottom of each upright that, like top caps, cover up the base plate and are mainly aesthetic. The inside surface of the swimming pool is covered by a thin layer of vinyl used to contain the water within the structure. Liners are designed to fit specific sizes of pools, so it is important to be sure that you have the correct size. As your pool ages, the liner may become worn, possibly even torn or punctured, and may need to be replaced. Underwater patch kits can be used to prolong the life of the liner, but typically, you can expect a liner to last between five and ten years. Learn more about vinyl pool liners. Attached near the top of your pool, about 3/4 the way up the wall, you will find the skimmer. It is the opening that you see from inside the pool, right at the waterline, where the water is being taken into the filter system. A skimmer's job is to pre-filter the water of larger debris before it gets to the filter, as well as help to keep the water clear of floating debris. Most pool skimmers have a flapping baffle, called a wier, that helps to keep any floating matter trapped inside it, as well as regulate the amount of water that it processes at any given time. In the well of the skimmer, you'll find a basket, where leaves, bugs, and other debris can collect. The baskets can easily be removed from outside of the pool and its contents dumped out. Doing this regularly will ensure consistant waterflow to your filter system. For many pools, skimmers also provide a connection point for vacuum systems. When you want to sweep the pool, a specially designed vac hose is connected through the skimmer using a vacuum plate, and when the pump is turned on, the suction will now power your pool vac.